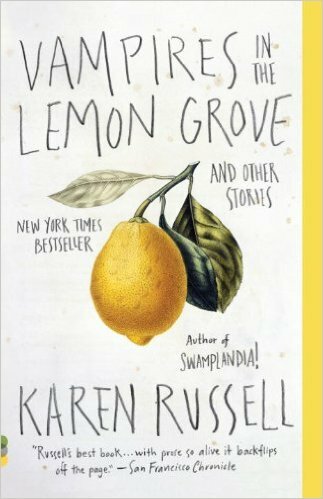 With Vampires in the Lemon Grove, Karen Russell delivers a diverse set of short stories that reach deep into the realm of bizarreness. A vampire couple struggles to quench the unquenchable thirst while trying to fully realize their identities in a foreign world. A group of girls are held captive in a malicious, cutting-edge new factory that specializes in turning girls into human-silkworm hybrids and producing silk in the midst of a silkworm famine. Seagulls communicate the secrets of the universe to a troubled teenager. A family’s quest for land in a dystopian American Old West leads to unfortunate (and inexplicable) consequences. These are just a few of the oddities to look forward to in Russell’s follow-up to her 2011 Pulitzer Prize nominated Swamplandia! which earned praise from nearly everyone across the board. Vampires is nothing short of a good collection, but it’s a mixed bag. Russell likes (and is very good at) building worlds with her stories. These worlds are reflective of our world and most of the time Russell does a great job of emphasizing the part of society she’s commenting on by making that the bizarre part of this new world. For example, humanity’s capacity for greed and exploitation is represented through the silkworm famine in a version of Japan that still seems to cling to classical values in “Reeling for the Empire”. The ridiculous (and sometimes destructive) lengths people will go to over sports is shown through the nonsensical “foodchain games” in one of my favorites of the bunch “Dougbert Shackleton’s Rules for Antarctic Tailgating”. Sometimes the meaning behind the allegory takes a couple of reads to uncover, but more times than not Russell makes it clear why the world she’s depicting is the way it is. The characters are, however, hit and miss. Miles Zenger and Beverly in “Proving Up” and “The New Veterans” respectively are solid characters whose motives and progression are clear and strong throughout the story. Each has a unique voice that comes through in the narration and each has aspects the audience can relate to. Miles’ naivety and ambition and Beverly’s desire for attachment and fulfillment really speak to the reader. Others, like Rutherford B. Hayes in “The Barn at the End of Our Term” and Nal in “The Seagull Army Descends on Strong Beach, 1979” respectively are relatively flat and don’t do much to make the readers connect with them. I’m still not sure I can recognize Hayes’ inner conflict and Nal seems like the dejected teenager that Salinger pioneered and everyone else copied. Russell is at her best when using the bizarre elements to augment her commentary, but when she lets the weirdness take the wheel, the stories tend not to be as strong. “Reeling for the Empire” is a great example for the weirdness overshadowing the bones of the story. The story itself follows a fairly basic template (don’t worry, no spoilers) but the layering of strange upon strange ends up distracting the reader and takes away from the impact of the climax. And because it is so weird, a story that could’ve been extremely harrowing ends up being a bit corny. Similarly, “The Barn at the End of Our Term” is another story that was hindered by its bizarreness rather than helped. Having a slew of dead presidents reincarnated as horses is a very interesting concept, but Russell doesn’t deliver on the political and situational commentary that she sets up. Instead (again, trying to avoid spoilers) the story serves as more of a love song. Which leaves me feeling that she’s being bizarre for bizarre’s sake. Other times, Russell’s subtle use of odd elements charge the story and force you to think twice about our society. The bone trees in “Proving Up” make the audience reassess their predispositions about the romanticized American West. As I mentioned earlier, the foodchain games in “Dougbert Shackleton’s Rules for Antarctic Tailgating” supplement the focus of the dangerously stupid behavior of rabid sports fans in the modern age. All the stories are well-written and are littered with strong description and varied dialogue. At times, Russell tends to drag things out a bit, but the stories are always entertaining enough to get through. Vampires in the Lemon Grove is a fun, well-written and thought-provoking set of short stories with its own set of flaws. Even if every story doesn’t excite you, I have no doubt that at least one will. About the author: Karen Russell, a native of Miami, won the 2012 National Magazine Award for fiction, and her first novel, Swamplandia! (2011), was a finalist for the Pulitzer Prize. She is a graduate of the Columbia MFA program, a 2011 Guggenheim Fellow, and a 2012 Fellow at the American Academy in Berlin. She lives in Philadelphia. About the author of this post: Kevin Dieber is a sophomore at North Central College.